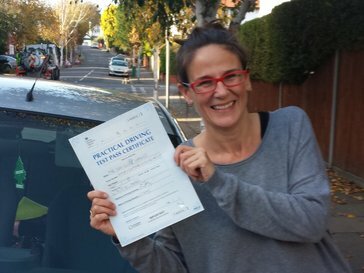 "I highly recommend Vinney and the Fulham Driving School. Vinney is a great instructor. He helped me gain confidence not just on the road, but in myself too. With his encouragement and motivation I was able to pass my test first time - and I can say I am the first in my family to do so! Vinney was clear from the get go - his intention is to make sure you will be a safe and confident driver for life, not just for the test. He is very professional, meticulous and ensures you understand every step of the way, he puts you at ease with his patience and a good sense of humour. It was a pleasure learning from him. Vinney, you are a star, thank you." "After the lifespan of my international licence finally expired I had a fair few 'bad habits' to get over in order to pass my UK test. Thanks to Vinney I managed to achieve this with flying colours in only 4 weeks. " "I was a reluctant driver and had put off learning to drive for years. I eventually found the courage to learn and Fulham Driving School recommended Graham as a brilliant instructor for someone who was nervous. Graham was fantastic and I thoroughly enjoyed learning to drive with him. He was calm and patient and we also had great conversations which helped keep my nerves at bay! I was so surprised to pass first time but Graham said he knew I could do it - and ultimately, that's what you need in an instructor." safe on the roads. I would describe his way of teaching professional, thorough and pure excellent. 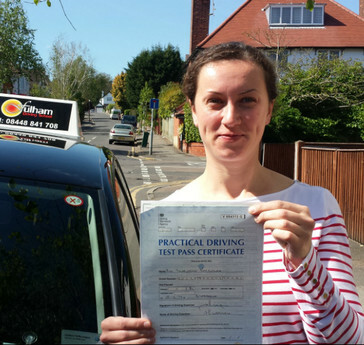 I am really pleased with this experience and would strongly recommend Vinney from Fulham driving school. The school offers value for money and skills for life. You could not get a better instructor than Vinney. "From finally getting the courage to take driving lessons, I can now proudly say that today I am a confident driver who actually enjoys driving. The confidence did not come easy to me, it took a lot of hard work and practise, thanks to my amazing instructor Vinney. I have to admit, the experience in driving a car for the first time was quite fearsome, at times difficult, but with the help and support throughout from Vinney, I managed to overcome that and started to enjoy the whole process more. I passed my practical test the first time and couldn't be happier to have had Vinney as my instructor and would highly recommend him." 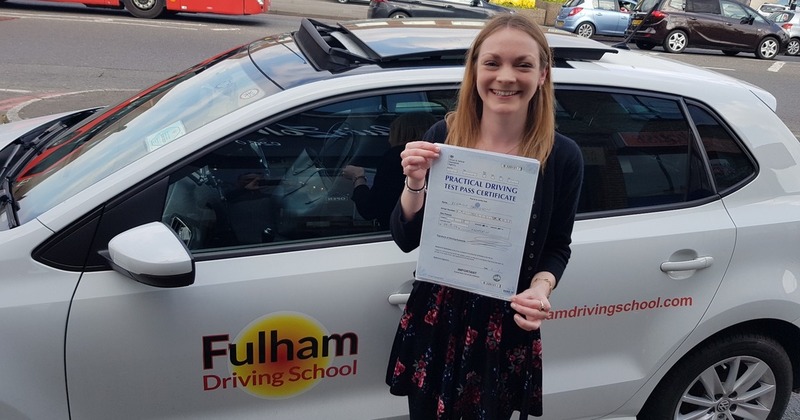 "My whole experience with Fulham Driving School was brilliant - from the start when I called and spoke to the lovely (Lisa) to book my driving course, to the actual lessons with the very patient and wonderful Vinney. I couldn't have wished for a better instructor who got the measure of me immediately and gave me all the knowledge and confidence I needed to pass my test. I am delighted to be on the road and it's all thanks to Vinney and Fulham Driving School." 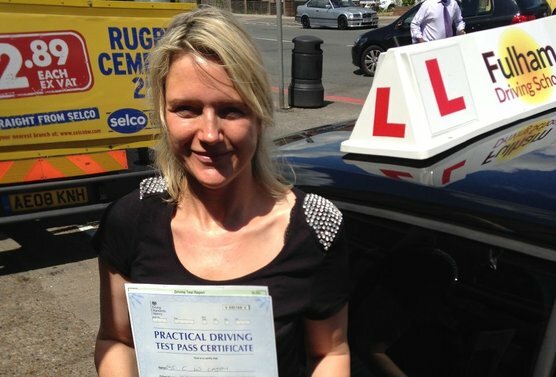 "I've never though that I'd be able to drive a car, but thanks to dedicated and very patient driving instructor Vinney, I'm now able to! I'm very happy that I passed my driving test the first time, which was a great and fun experience. 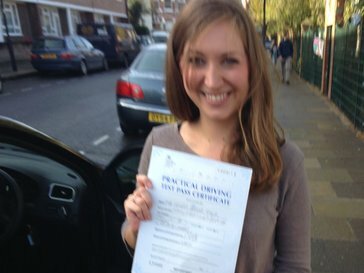 I'd highly recommend Fulham Driving School to all my friends as it's the right place to study driving. If even I was able to pass my test - everyone can make it! Very big thanks again to Vinney, who helped me to push the limits and boost my confidence!" "Thank you for all your help and support in my lessons and passing my test! 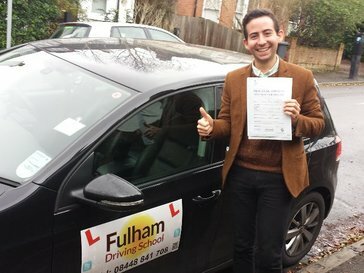 raham from the Fulham Driving School is excellent and gives good direction and has a calm demeanour in both driving skills and preparing me for my driving test! He put me at complete ease and made my lessons pleasurable with his encouraging and knowledgeable experience. I can't believe I passed first time around, but that's all down to to Graham. Thanks again Graham!" 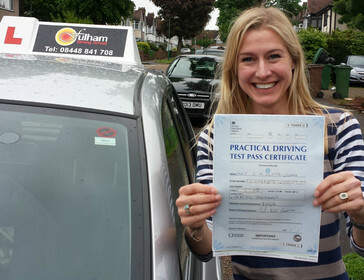 "I passed my test first time after a few weeks of driving tuition with Vinney! Vinney knew exactly how to work with me to get me to test standard. He pushes you to work hard but can also give you a break if things get a bit too much and he gives you plenty of feedback on what area(s) you need to improve. He helped me to work on my biggest issue (confidence) and made me feel trustworthy of making my own decisions on the road. Vinney is very good at finding your weaknesses and working with you to eliminate them. He changes his teaching style to suit the individual and this can be very helpful if you are feeling nervous or unconfident with your driving ability. I would describe Vinney as professional, competent but most of all FUN! 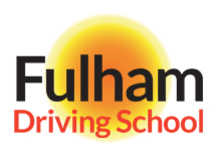 I recommend Fulham Driving School to everyone wanting to drive - Fulham Driving School don't just teach you to drive to pass your test, they teach you a life skill and teach you to keep safe on the roads for life!" "Thanks to Vinney I passed my driving test the second time (after first failing with the pressure of passing the day before I travelled to Australia). One lesson after I came back 18 months later, he told me I wouldn’t need a whole lot more teaching (which was very honest of him as he could have suggested more and have been paid more). Vinney’s style of teaching is you get from it what you put in’ as he demands quite a lot, but then ensures you have very high standards which makes you a better driver and makes you more likely to pass. Lessons with Vinney were interesting, he certainly is a character, making you able to relax in what can be a stressful learning experience but also able to get you to knuckle down when necessary. 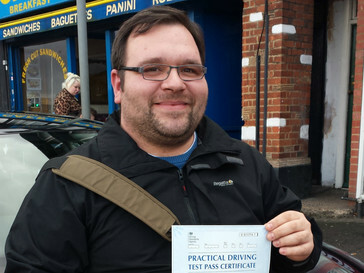 I highly recommend Vinney and Fulham Driving School!" 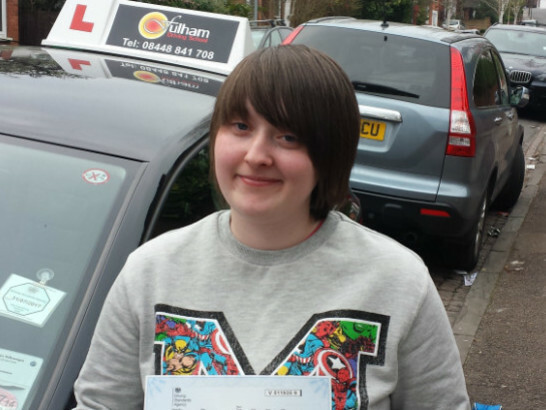 "I still cannot believe that I passed my driving test first time! And I couldn’t have done it without the help and guidance of my instructor, Vinney. He is an extremely professional, patient, diligent and friendly instructor, he gives you plenty of advice throughout and his main focus is to teach you how to become a safe and confident driver –and not only to pass your test! It has been a very good experience, demanding but rewarding, and I will make sure to adhere to the highest driving standards as I have been taught. 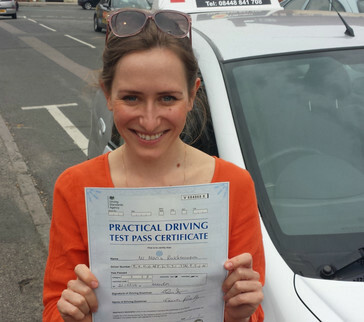 I couldn’t be happier with my instructor, so I highly recommend Vinney and Fulham Driving School."